How about wearing not just a brand that is thoughtlessly adorned, or a style just because it is trending, but a piece which is unique and has a story woven into its creation? That’s exactly what each one-off Rajdeep Ranawat piece is all about – inspiration from both nature and the places he has travelled to, the exclusivity of the forms he puts together. Every garment, from a mile away, is sheer artwork. “We customise the design to the clients specifications, size it according to them and create a piece to perfection which is exclusive to that customer.” Not a chance there is to run into someone dressed identical to you. Hailing from an Indian army background and very well-travelled, Rajdeep from a young age has been keen on Arts. A retired Lt. General now, his father was the one to pick up on his son’s talent and encourage him to pursue his career in Fashion Design. While at Fashion School, Rajdeep’s graphic design skills incorporated with his artistic abilities took the French company he interned with by storm. Rajdeep would photograph, sketch and scan prints to put together an entire line sheet which no one else at that time was producing. He was then hired by the same company which he worked with for 3 years in Paris. This also exposed him to a lot of international fashion shows, from which he learned much in terms of print and embroidery-focused design. What is it that keeps his creative juices flowing? Every season, this creative designer travels to a new country and photographs sights and scenery, proceeding to illustrate motifs. While he maintains the aesthetics of his creations, there is always a transition in the mood and stories he tells through them. 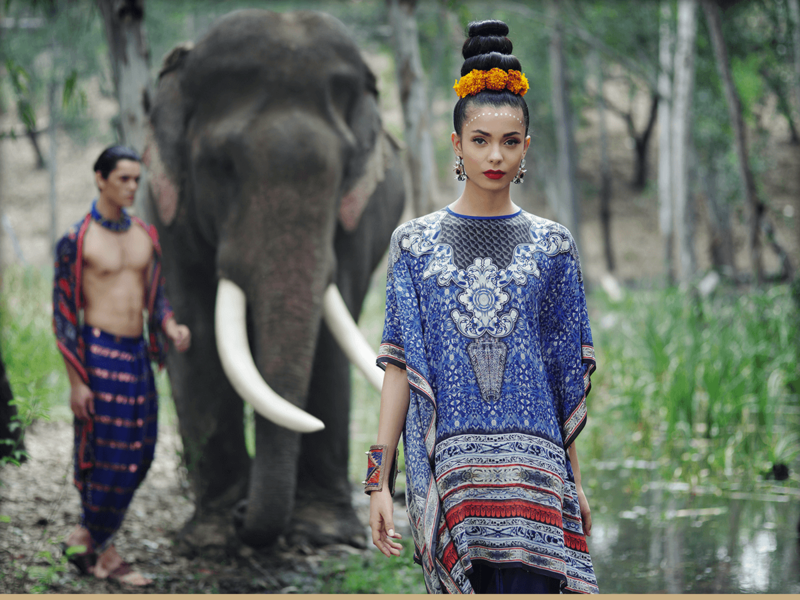 Rajdeep Ranawat introduces his latest Autumn/Winter 2016 resort and luxury pret range for both women and men, a collection titled “Bali” inspired by the namesake city itself. The collection is an amalgamation of 4 different themes within the region of Indonesia inspired by various arts, crafts and architecture around, apart from Bali’s stunning tropical motif from nature. The season starts with the theme ‘Chintz’, inspired by the Victorian and Old World motifs from the garments of Chinese and Indonesian royals, transformed into pretty prints on resort clothing in hues of ivory, creme, beige, mustards with a dash of olive and navy highlighted in beautiful chintz florals in reds, whites and pinks. This collection is a great beginning to the season with its fresh notes and fragrant silhouettes that are breezy yet stylish and comfortable. The second theme, ‘Ubud’ is a festive and vibrant collection inspired by the hand-illustrated temples and motifs from the tropical forests of Ubud. Playful foliage of orchids, jasmine and palm leaves are meticulously paired with gorgeous Macaws, Hornbills and monkeys from the forests to create this fun and quirky range in luxurious chiffons and silks in the form of kaftans, jumpsuits, tunics, hilo tops and comfy culottes. The palette includes raspberry, cobalt, emerald, beetroot, mint and mustard for the start of a fabulous festive season. ‘Batik’ is the craft that is synonymous with Indonesia, and this has been interpreted in the form of high-resolution prints on silks for the third theme in the same collection. Tye-Dye techniques of Shibori were superimposed with motifs derived from temples and other forms of crafts from Bali to create yet another theme with layered silhouettes perfect for travel or any casual outing. This range is mostly created in soft and fine thread count cottons combined with silk organza prints for a formal look with translucency in the casual range itself. Colours like indigo, cobalt, ivory, beige, mustard have been used vigorously to compliment the prints. The season concludes with ‘Svargaloka’, inspired by the ancient temples in the regions of Bali and Ubud. The designer captured the beauty of these temples by photographing the intricate details of the carvings and woodwork along with the rich gold paintings on the doors and pillars. This collection is a perfect start to the end of the year into January with Christmas and the New Year, where the prints complement the mood through the hues of navy, orange, black, charcoal, grey and ivory. 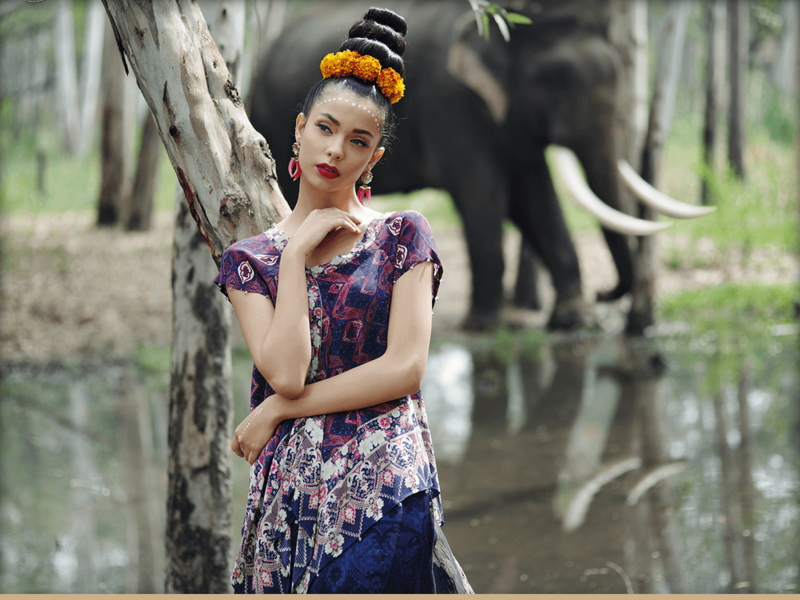 Rajdeep Ranawat has captured the essence of Bali beautifully in his latest campaign with the elephant in the wetlands of Ubud’s rice plantation fields forming the backdrop of his showcase. If you haven’t already gotten your hands on one of these pieces, you still have some time left – the collection of 4 themes is available in all major stores including the Rajdeep Ranawat flagship store in Delhi until January 2017.